Notes: I had more than six fillets from the tin I opened earlier in the week, and I was wary of putting them all in, but I figured it couldn’t hurt. I gave it about half a lemon’s worth of juice for an acid note, because I think everything tastes better with a little acid, and other than needing a few more anchovies, this was really great. Rating: She may not look like much, kid, but she’s got it where it counts. Damn you.I want pasta now. 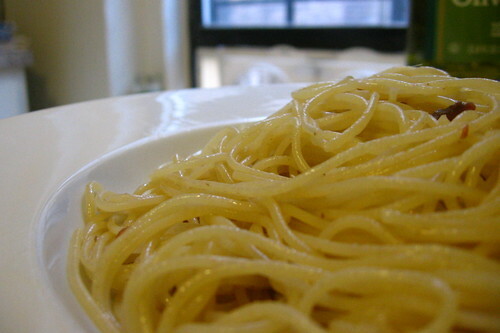 One of my favorite side dishes is to take hot pasta, and mix a splash of olive oil with some butter and freshly grated parmesean and ground pepper. I read somewhere recently the advice to always buy anchovies in glass jars, and always skip those that are canned. I haven’t done a side-by-side taste test, but I did start buy the jarred anchovies, which are easy to find. They’re also handy in that you can put the lid on and save some for later.